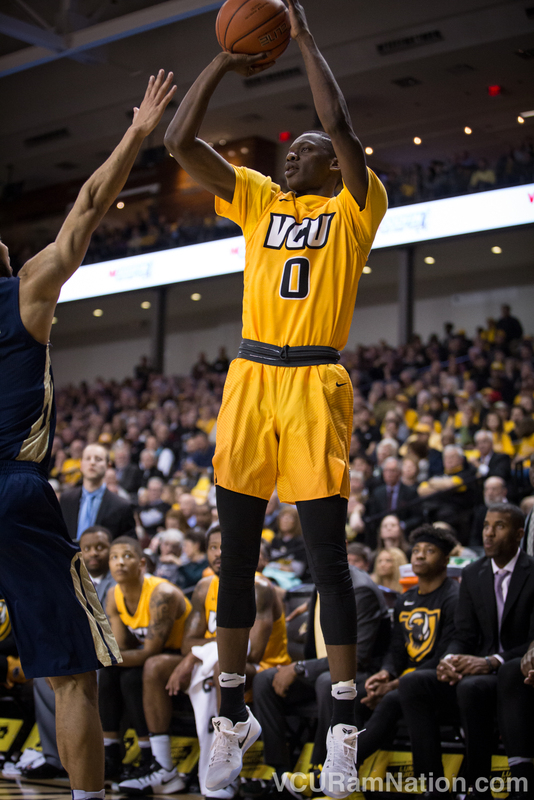 De’Riante Jenkins came off the bench to score 11 points for the Rams in VCU’s comeback win at Old Dominion. At times tonight it looked as if VCU was headed toward a certain loss to bitter rival Old Dominion, but at the end of 40 minutes, the Rams owned a 67-64 advantage and thus, the lead when it mattered most. The VCU Rams needed a big win at Old Dominion tonight and that’s exactly what they got, defeating ODU despite trailing by 11 with 7:37 left in the game. The Rams erased that 11-point deficit in just over a minute and a half with an explosive 11-0 run to tie the game thanks to a culminating four-point play from JeQuan Lewis. After an ODU made free throw — just one of two in a night the Monarchs would struggle from the line (13-28) — VCU took a 57-56 lead thanks to a JeQuan Lewis’ basket, a lead they would never surrender. Lewis hit a three-pointer 40 seconds later to give the Rams a four-point lead, then traded points with ODU until the Monarchs got within one with just 41 seconds to play thanks to a B.J. Stith made layup. The Monarchs then fouled Johnny Williams with 37 seconds to play who went to the line to hit one-of-two to extend the lead back to two points. ODU went for the win on their following possession but couldn’t draw enough iron to avoid a shot-clock violation that gave the Rams the ball with six seconds to play. ODU fouled Justin Tillman on the following possession where he would go 1-2 from the stripe, giving the Rams the 67-64 breathing room final score they would ride to victory thanks to one final missed three from the Monarchs. While ODU wasn’t able to hit the deep ball late in the game, they started the game red-hot from distance, hitting seven of their first nine threes despite coming into the ranked 330th nationally in three-point shooting at 28.6%. The Monarchs finished 7-14 from three-point range but shot just 44% overall and an abysmal 13-28 from the free throw stripe that virtually handed the Rams the win. JeQuan Lewis was a key part of VCU’s comeback and finished with a game-high 20 points in the win. Lewis played 32 minutes before fouling out late. The other player that helped spark the Rams was freshman De’Riante Jenkins who looked brilliant in his 11-point, six-rebound performance. Jenkins made the big plays when the Rams needed them the most and finished an efficient 5-8 from the field in his 21 minutes of action. Justin Tillman hit that final key free throw late and finished with six points a game after dumping 26 on Georgia Tech. Tillman led the Rams with eight rebounds in a night VCU would surprisingly out-rebound an ODU team that ranks 17th nationally in rebounds per game. Mo Alie-Cox would add eight rebounds of his own and finish with a game-high four blocks for VCU. As ugly as it may have looked at times, VCU’s 67 points scored against the Monarchs was the most ODU has allowed in regulation all season. ODU allowed 69 points in an overtime loss to Louisville and is giving up just 57.6 points per game, good for sixth nationally. The win snaps a two-game VCU (7-3) losing streak heading into another tough matchup with a CUSA opponent. The Rams will host Middle Tennessee State (9-1) at the Siegel Center next Saturday.